The 10-year Arming Initiative was approved by the Government of Canada to enhance border security and improve officers' ability to pursue enforcement activities and handle and mitigate high-risk situations by equipping designated frontline personnel with a duty firearm and associated training. In turn, this provided officers with a broader range of intervention options with which to respond to dangerous situations and conduct enforcement activities. The evaluation presented herein is a requirement of the approved Arming Initiative Treasury Board submission. The purpose of this evaluation is to examine the performance (effectiveness, efficiency and economy) of the Arming Initiative. This includes the extent to which the arming of CBSA officers achieved expected outcomes, such as enhanced border security, improved officer ability to handle high-risk situations, and decreased Agency reliance on other law enforcement organizations. The evaluation does not include relevance questions. The evaluation covers the 10-year implementation of the Arming Initiative (from March 2006 to March 2016), as well as its impacts thereafter, and builds on the 2009 Evaluation of Arming and the 2015 Audit of Arming. The scope of the evaluation includes the arming of frontline personnel at land ports of entry and in the Enforcement and Intelligence Operations Directorate and marine contexts. The evaluation was conducted from FY 2016-2017 to FY 2017-2018 and included both quantitative and qualitative research methods. The evaluation team conducted interviews within the CBSA and with external stakeholders, analyzed program performance and financial data, reviewed key documentation, and conducted field research in three regions (Prairie, Quebec and Southern Ontario) between February and March 2017. Over the course of the implementation of the Arming Initiative, discernible and continuous improvements were made to arming training (i.e. the triennial recertification), and arming training programs are well-regarded (i.e. the Duty Firearm Course, the annual recertification and the triennial recertification). However, a notable decline was observed in Skills Enhancement Course pass rates and there was an indication that participation in off-duty practice and the consumption of available practice ammunition rounds is low. The Arming Initiative and Use of Force training have enhanced officers' ability to exercise their authorities by increasing their confidence, preparation, and the ability to assess safety risks and to respond to high-risk situations. The Arming Initiative has had a positive impact on border security through increased border intervention timeliness and response to a wider spectrum of threats. This was found to be most evident in the change in procedure surrounding the handling of armed and dangerous individuals at the port of entry. Prior to Arming, subjects of an armed and dangerous lookout were dealt with through a 'release and notify' process (release into Canada and notify the police for subsequent interception), with response times dependent on the proximity and availability of other law enforcement organizations. As a result of Arming, the CBSA provides a more immediate response, as armed and dangerous individuals are now intercepted at the border. Furthermore, work refusal data suggested that officers no longer raise safety concerns with regards to the handling of armed and dangerous individuals, as a result of Arming. The evaluation found evidence to suggest that the CBSA has reduced its reliance on other law enforcement organizations, in specific contexts and regions, and now plays a more significant and active role in the enforcement community as a result of their enhanced risk assessment and preparedness following the implementation of Arming.Footnote 1 This is most notable in the handling of armed and dangerous individuals and in the increased autonomy of Enforcement and Intelligence Operations Directorate officers in conducting certain enforcement activities. A number of ongoing challenges associated with Arming, as a steady-state program, were identified. These included certain operational and human resources challenges and costs related to, for example, officers accommodated as a result of not meeting the new requirements of their now armed positions, mental health supports, the understanding and application of certain policies, the ergonomic implications of the defensive equipment, and recruitment and training. The Arming Initiative was implemented as intended, targets to train and arm the frontline workforce were achieved within the timeline and under the original budget, and the Agency's relationship with other law enforcement (i.e. the Royal Canadian Mounted Police) was effectively leveraged. By March 2016, the conclusion of the Arming Initiative, over 6,492 officers had been trained and armed, exceeding the initial target of 4,800. In addition, this target was exceeded under budget, with a budget variance between planned ($785M) and actual ($694M) expenditures of -12%, as of April 2016. Arming governance and management was shifted and modified during the implementation of the Arming Initiative to improve delivery and to help ensure objectives were met. This was cited as an important contributor to the Agency's increased training rate during the latter half of the Initiative, as well as its ability to surpass original training targets. Many formal governance mechanisms have since dissolved and have been replaced with the "one HR" approach to address ongoing policy and human resources issues. With Arming integrated into regular CBSA operations, opportunities for improved economy and efficiency related to training and recertification have been identified. This includes greater local/regional delivery of certain recertification training to reduce travel costs and increase convenience for officers, enhanced partnerships with other law enforcement organizations to further facilitate the sharing of resources, and the continued evolution of the Use of Force training with consideration for the CBSA operational environment. The Vice-President of HRB, in consultation with the Vice-President of Operations, should implement the current phase of the Workforce StrategyFootnote 2 to mitigate the impacts of arming-related accommodations on frontline service delivery. The Vice-President of HRB, in consultation with the Vice-President of Operations, should enhance the understanding and application of the existing policy on the wearing and handling of the protective and defensive equipment in all modes. Implement tools to support managers and employees working in an armed environment. Implement training initiatives related to officers' awareness and knowledge of the mental health of clients. The Vice-President of HRB, in consultation with the Vice-President of Operations, should complete the assessment of the uniform and duty equipment as a self-defence system, with consideration for ergonomic issues, to ensure that operational needs are met. The Vice-President of HRB should assess firearm training and skills maintenance, including qualification requirements, to ensure that operational needs are met. The evaluation of the Canada Border Services Agency (CBSA) Arming Initiative is a requirement of the approved Arming Initiative Treasury Board submission. As a result, the evaluation was identified in the 2015-2020 CBSA Five-Year Evaluation Plan which was approved by the Executive Evaluation Committee in May 2015. In accordance with the 2016 Treasury Board Secretariat Policy on Evaluation, the purpose of the evaluation outlined herein was to examine the performance (effectiveness, efficiency and economy) of the Arming Initiative. Specifically, the evaluation focused on assessing the extent to which the arming of CBSA officers achieved expected outcomes, such as enhanced border security, improved officer ability to handle high-risk situations, and decreased Agency reliance on other law enforcement organizations. Therefore, the evaluation does not include relevance questions. The evaluation first provides an examination of the design and delivery of the Initiative, followed by an assessment of the achievement of outcomes, ongoing program challenges, and opportunities to more efficiently support ongoing firearm certification. The evaluation covers the 10-year implementation of the Arming Initiative (from March 2006 to March 2016), as well as its impacts thereafter, and builds on the 2009 Evaluation of Arming and the 2015 Audit of Arming.Footnote 3 The scope of the evaluation includes the arming of frontline personnel at land ports of entry (POE) and in the Enforcement and Intelligence Operations Directorate (EIOD) and marine contexts, excluding air mode operations. The CBSA administers over 90 acts, regulations and international agreements with a mandate to provide "…integrated border services that support national security and public safety priorities and facilitate the free flow of persons and goods..." The authorities and capabilities of CBSA officers to fulfill their role in relation to national security and public safety priorities have evolved over time. The passage of Bill C-18 in 1999 amended the Customs Act and the Criminal Code, granting officers the authority to detain and arrest individuals at the border for specific non-customs related offenses. In 2005, Bill C-26 amended the Criminal Code and granted peace officer status to officers, as designated under subsection 138(1) of the Immigration and Refugee Protection Act. The CBSA subsequently introduced Use of Force training and equipment, which included the baton, pepper spray and protective equipment (soft body armour). In 2006, the 10-year Arming Initiative was approved by the Government of Canada to enhance border security and improve officers' ability to pursue enforcement activities and handle and mitigate high-risk situations by equipping designated frontline personnel with a duty firearm and associated training. In turn, this provided officers with a broader range of intervention options with which to respond to dangerous situations and conduct enforcement activities. This evaluation assesses the effectiveness, efficiency and economy of the Arming Initiative at the end of its 10-year implementation. The Federal Budget of May 2006 announced funding of $101M over a two-year period to begin arming officers and to eliminate work-alone situations (also referred to as "doubling-up"). Full implementation, however, was expected to take 10 years. Building upon and developing further the policy objectives identified in the two-year profile of Budget 2006, the Government of Canada approved a 10-year strategy to arm officers. The CBSA committed to arm and train 4,400 frontline personnel at land and marine POEs, as well as those conducting enforcement functions in-land. Additionally, the Agency committed to arm and train 400 new officers, hired to eliminate all work-alone situations. At the conclusion of the Arming Initiative in March 2016, the Agency had exceeded its original commitment to train 4,800 officers, within the approved project funding. The Agency ultimately trained 6,492 officers due to an increased requirement for 200 non-uniformed officers, 500 land and marine officers, and additional officers conducting off-site verifications. The majority of personnel in designated armed positions were trained within the final three years of the Initiative. The Defensive Tactics Program Division (formerly the Arming Division) is part of the Training and Development Directorate (TDD), Human Resources Branch (HRB).Footnote 5 During the implementation of the Arming Initiative, the Division was accountable for directing the process of arming authorized CBSA officers and providing training, a policy foundation and a management framework. The Security and Professional Standards Directorate within the Comptrollership Branch was accountable for establishing and evaluating the standards for the secure storage of Agency firearms and ammunition, as well as for investigating and reporting upon relevant matters of alleged misconduct involving Agency firearms, ammunitions and/or other defensive equipment. Senior management in the regions was responsible for ensuring that the Agency complied with the arming and Use of Force policies, directives and standard operating procedures (SOPs) issued by the Defensive Tactics Program Division, as well as ensuring the availability of officers to attend training and the application of established processes and procedures. Of a total $1.07B funding profile approved by the Government of Canada, $785M was allocated to the Arming Initiative to cover the costs of equipment and uniforms, training, infrastructure (including the construction of firearms training facilities at the CBSA college in Rigaud), and related management and coordination systems. The Agency decided to manage the remaining $289M separately as part of the "doubling-up" project within Operations Branch. As of March 2016, the conclusion of the project phase, ongoing funding of $39.9M (including corporate costs) has been allocated, across the Agency, for the steady-state Arming Program. The evaluation was conducted from FY 2016-2017 to FY 2017-2018 and included both quantitative and qualitative research methods (refer to Appendix C). The evaluation team conducted interviews within the CBSA and with external stakeholders, analyzed program performance and financial data, reviewed key documentation, and conducted field research in three regions (Prairie, Quebec and Southern Ontario) between February and March 2017. A quantitative assessment of efficiency could not be conducted due to a lack of relevant financial data to calculate a cost per arming training participant over time. Over the course of the implementation of the Arming Initiative, there was a discernible change in the Agency's training programs. The triennial recertification was subject to continuous improvement and the Use of Force training programs (i.e. the Duty Firearm Course, the annual recertification and the triennial recertification) are well-regarded. The Arming Initiative led to the creation of a full curriculum and delivery model to support an armed workforce, including: the Duty Firearm Course (DFC), Triennial Recertification, Annual Recertification, a mandatory/supervised duty firearms practice session, and Skills Enhancement Training Courses (for additional information on each of the aforementioned Use of Force training programs, please refer to Appendix B). The DFC and the refresher training on Control and Defensive Tactics were provided to experienced officersFootnote 6 over the 10-year implementation period. The Use of Force (which includes the DFC) training was also integrated into the Officer Induction Training Program (OITP) in 2012, for new recruits. The national standardization of training. Regional, POE-based "red gun exercises"Footnote 7 were also widely-praised by officers who find this on-site scenario-based practice to be beneficial. Use of Force policies and SOPs. A drop in Skills Enhancement Course pass rates was observed. In FY 2012-2013, the Skills Enhancement Course (SEC) was introduced to assist officers who require additional instruction and practice to achieve a passing score in the annual and/or triennial recertification. If an officer that participates in an SEC is unable to achieve a passing score during their first SEC training event, they are scheduled to attend another SEC. From FY 2007-2008 to FY 2016-2017, recertification pass rates (annual and triennial) have remained high and officers' successful completion of recertification has been supported by the SEC (refer to Exhibit 1). However, to better account for the number of qualification attempts that are undertaken prior to the achievement of a passing score, it may be beneficial to further examine the manner with which success rates are measured and presented. There is an indication that participation in off-duty practice and the consumption of available practice ammunition rounds is low across the regions. At present, a single mandatory, supervised duty firearm practice session is provided to support officers' initial Annual Recertification. Each officer is permitted, thereafter, to use their CBSA-issued duty firearm for ongoing off-duty practice (on their own time and at their own expense) at approved firing ranges. A 2014 Arming Bulletin surrounding the launch of the off-duty practice policy further states that off-duty practice with a duty firearm was intended to allow officers to practice "often and regularly" to support the maintenance of skills and certification. To support ongoing voluntary off-duty practice, the Agency has approved the use of 95 practice rangesFootnote 13 and provides officers with 1,000 rounds of practice ammunition (per calendar year). Despite these provisions, field research interviewees indicated that participation in off-duty practice at many inland offices and POEs is low due to limited access to convenient and/or low cost practice facilities. To validate this perception, an analysis of the consumption of practice ammunition amongst a sample of six land POEs (both large and small) and three inland offices across Quebec, Prairie and Southern Ontario regions was conducted. While the data obtained was site specific, a number of key observations can be made with regards to overall trends. Amongst the sampled POEs and inland offices, participation in off-duty practice and the consumption of available practice ammunition rounds were low. The total percentage of armed officers at land POEs that participated in ff-duty practice during FY 2016-2017 was estimated at 15.8%. Amongst the three inland offices, an estimated 22.5% of officers participated in off-duty practice. Overall, of the total number of practice ammunition rounds allotted to armed officers at sampled land POEs, 10.7% of available rounds was consumed, while 10.8% of available rounds in sampled inland offices was consumed. In terms of access to convenient practice facilities, the average travel time to an approved firing range was estimated at 55.50 minutesFootnote 14 in the inland environment and 59.46 minutes in the land POE environment. There was no observable correlation between the average travel time from officers' work locations to an approved firing range and officer participation in practice (refer to Appendix D, Exhibits C and D) between the regions. However, within the Quebec region, POEs at East Hereford and Hereford Road had both the largest percentages of armed officers that participated in off-duty practice and the shortest average travel time to an approved firing range. Despite a limited sample and lack of available national data for this analysis, the current level of participation in off-duty practice with the CBSA-issued firearm indicates further assessment is required to ensure that the Agency's practice policy continues to effectively meet operational needs. Given the decrease in SEC pass rates and the low level of officer participation in off-duty practice, there may be a need to analyze the linkages between practice, SEC participation and the number of qualification attempts undertaken by officers prior to the achievement of a passing score at the annual and triennial recertification. Partnerships with other law enforcement organizations and adoption of new technology, such as the use of mobile simulators for practice shooting and annual recertification, were identified by interviewees as efficient and economic opportunities ith which the Agency might address challenges related to practice and success rates in recertification. The Arming Initiative and Use of Force training have enhanced officers' ability to exercise their authorities by increasing their confidence, preparation, and ability to assess safety risks and to respond to high-risk situations. The implementation of the Arming Initiative has expanded officers' intervention options. According to internal respondents, both at Headquarters and in frontline contexts, the introduction of the duty firearm represented the completion of the wheel of response options for officers, enabling officers to proportionally respond to the threat of death or grievous bodily harm (refer to Appendix D, Exhibit B). By providing an additional defensive tool and its associated training, the Arming Initiative was perceived by the officers, regional management, and management at National Headquarters to have increased officers' awareness of risks and to have elevated officers' abilities and confidence in threat assessment in certain high-risk situations. External law enforcement interviewees noted an increased level of confidence and comfort in the preparedness and skills of CBSA officers as a result of the Arming Initiative. Since its introduction, CBSA Incident Management and Reporting System (IMRS) data indicates that the duty firearm has been used by officers in the course of their duties. Between FY 2012-2013 and FY 2017-2018 (up to June 2017), there have been 146 use of force incidentsFootnote 15 involving the duty firearm. This exceeds those involving the baton or OC (pepper) spray.Footnote 16 Most incidents involving the duty firearm occurred at a POE (where the majority of armed officers are deployed) and involved the drawing of the firearm to the low-ready position.Footnote 17 A firearm was discharged in only eight of the 146 cases, the majority of which were related to animal control (7 related to animal control; 1 to protect an officer from an attacking dog). Furthermore, the majority of the 146 incidents (79%) occurred for reasons of: protecting oneself, protecting another officer, or protecting the public. Arming has had a positive impact on border security through increased border intervention timeliness and response to a wider spectrum of threats. The Arming Initiative has had a positive impact on border security as officers' ability to intercept threats at the border has increased. Between FY 2009-2010 and FY 2014-2015, 217 armed and dangerous lookoutsFootnote 18 were recorded per year.Footnote 19 Prior to Arming, subjects of an armed and dangerous lookout were dealt with through a 'release and notify' process (release into Canada and notify the police for subsequent interception), with response times dependent on the proximity and availability of other law enforcement organizations. However, as a result of Arming, the CBSA is now able to provide a more immediate response, as armed and dangerous individuals are now intercepted at the border and are referred to secondary examination as part of a mandatory process. There was an overall consensus amongst interviewees that Arming has increased officers' ability to protect the public directly (for example, by detaining armed and dangerous at the point of entry), as well as indirectly (for example, through a perceived deterrent effect and increased professionalism and confidence in the frontline workforce). However, limited quantitative information is available to support this finding. Based on work refusal data, officer safety concerns with regards to the handling of armed and dangerous individuals appear to have decreased. In calendar years 2005 and 2006 (prior to the implementation of Arming), 51 work refusals related to armed and dangerous lookouts were recorded nationally. However, from calendar years 2013 to 2016, in which the majority of designated officers received arming training, there were no reported work refusals related to armed and dangerous lookouts.Footnote 20 It should be noted that officer presence, technological advancements and enhanced intelligence systems may have also contributed to alleviating the safety concerns of frontline personnel. There is evidence to suggest that the CBSA has reduced its reliance on other law enforcement organizations in specific contexts and regions, and now plays a more significant and active role in the enforcement community. Prior to Arming, officers relied on external law enforcement organizations for assistance in most high-risk situations, such as the interception of armed and dangerous individuals. With the introduction of Arming, CBSA officers provide a more immediate response, as they now have the ability to autonomously intercept individuals at the point of entry. An incident involving the potential arrival of an armed and dangerous individual at a land POE in the Prairie region was highlighted as an example in which the Agency exhibited a reduction of its reliance on other law enforcement organizations. During this incident, a local law enforcement officer responded to a call for assistance made by on-duty CBSA officers with regards to the potential arrival of a creditable armed and dangerous individual at the port. Based on the local law enforcement officers' discussions with the CBSA officers on duty, the external law enforcement member was satisfied with the CBSA officers' risk assessment and their preparedness. As a result, the local law enforcement officer departed the POE and did not feel the need to provide back-up support to the CBSA. This example suggests that the arming of CBSA officers has allowed other law enforcement organizations to reduce the time and resources previously devoted to assisting CBSA officers in specific contexts. In the inland context, Arming has also had an evident impact on the reduction of the Agency's reliance on other law enforcement. Interviewees indicated that, as a result of Arming, the increased range of enforcement actions conducted by EIOD officers (such as, for example, 'door knocks') without the assistance of other law enforcement has improved the overall efficiency of their inland operations. While the CBSA continues to cooperate with external law enforcement in specific high-risk situations, external law enforcement interviewees further confirmed that the CBSA has become a more fully participating member in enforcement activities and joint force operations related to the CBSA's mandate, and is no longer viewed as a safety liability. As a result of their training, supported by the creation of online courses, such as the Officer Authorities Course developed by the TDD, officers communicate with other law enforcement in a 'common language' and have complementary capabilities, leading to the more efficient leveraging of both organizations' resources and expertise. A number of ongoing challenges associated with Arming, as a steady-state program, were identified. According to interviewees, the enhanced training and responsibility that followed the implementation of the Arming Initiative has contributed to increased professionalism, pride and confidence amongst officers. The introduction of the duty firearm has also contributed to advancing the Agency's gradual cultural shift toward a focus on its national/public safety mandate. However, there are certain operational challenges and costs associated with the implementation of Arming. The impacts of the accommodation of officers who are unable to meet the requirements of a designated armed position are notable.Footnote 21 The Agency's Policy on the Duty to AccommodateFootnote 22 indicates that management must consider all options to meet accommodation needs, which can often include adaptive technology, modifying work, or exchanging job tasks with other employees. Prior to the implementation of the Arming Initiative, it was estimated that approximately 1% of the workforce to be designated as armed would require accommodation as a result of not meeting the new requirements of their now armed position. This estimate did not include those already accommodated/unable to meet Control and Defensive Tactics and Use of Force requirements. Based on the original Arming funding profile, $2.3M in ongoing funding was allocated toward arming-related accommodations. A funding review conducted by the HRB and Comptrollership Branch assessed the current number of accommodations at 4%Footnote 23 of the armed officer population and estimated an ongoing cost of $23M. As a result, a variance in funding of approximately $20M was identified. Based on an analysis conducted as part of the evaluation, officers specifically requiring arming-related accommodations were estimated to account for approximately 7.3% of the armed workforce (2.5% temporary; 4.8% permanent).Footnote 24 Subsequent cost estimates identified an ongoing cost between $22,833,083 and $27,446,121.Footnote 25 Therefore, a variance in funding between approximately $20M and $24M may exist. This suggests that the HRB and Comptrollership Branch variance estimate of $20M might be conservative (refer to Exhibit 2). The calculated costs represent the total number of temporary and permanent arming-related accommodation cases and the funding associated with enabling frontline POEs to continue to deliver the established level of service. Future research into how the CBSA's rate of arming-related accommodation compares to that of other armed, law enforcement organizations may be beneficial. Source: Corporate and Program Services Directors, as of April 2017, from cost estimates developed by the Evaluation Team. To date, the Agency has primarily accommodated officers within ports or regions. However, due to the limited number of unarmed positions available, particularly in the regions, employees that require permanent accommodation are often not indeterminately placed in unarmed positions. Regional management indicated that the existing Agency policy (introduced based on the assessment of the risk faced by officers in certain areas/operations) creates significant challenges in meeting frontline operational and staffing requirements within budget, as accommodated (unarmed) officers are precluded from conducting public-facing duties and cannot, in turn, perform the full range of frontline and enforcement operations as an armed officer. Additionally, tensions exist in some workplaces, as there is a perceived inequity between the armed and the accommodated/unarmed duties of officers occupying the same job classification. This is based on the notion that accommodated/unarmed officers do not conduct the full range of the frontline activities of their armed colleagues. The Vice-President of HRB, in consultation with the Vice-President of Operations, should implement the current phase of the Workforce Strategy to mitigate the impacts of arming-related accommodations on frontline service delivery. In specific contexts, field research suggested that officers perceived a lack of acknowledgement, in Agency policies and procedures, of the EIOD and marine work environments. In particular, officers expressed the notion that existing policy lacked flexibility in the wearing and removal of the defensive and protective equipment and was subsequently inhibitive to the effective execution of their duties. However, this flexibility is available through existing CBSA policy.Footnote 26 Agency procedure states that officers must wear the protective and defensive equipment issued to them when on duty (working at a CBSA office or other location in Canada) and while engaged in the performance of their legislated duties. However, it also allows officers to remove their protective and defensive equipment, provided that a risk assessment has been completed, management approval has been obtained, and the removal of the equipment is justified. This might include the removal of some, if not all, of the defensive equipment, as long as the removal of equipment is in line with the Incident Management Intervention Model (i.e. the highest response option must be the first to be removed). If defensive equipment of any type is worn, officers are required to wear the protective equipment (e.g. vests). There was inconsistent understanding and application of the policy and procedures on the removal of the defensive and protective equipment in regional operations, which highlights the need to strengthen the interpretation and application of the current arming policy and procedures. Although this evaluation does not include an examination of the air mode operation, similar concerns may exist amongst officers who work in passenger operations in the air mode. Therefore, it may be worthwhile for management to consider enhancing the understanding and application of the policy in all modes. The heightened risk of psychological stress for officers, as associated with the responsibility of carrying the duty firearm, was identified by frontline interviewees over the course of the evaluation. In promoting officers' health, well-being and effectiveness in performing their duties and in interacting with clients, the creation of an environment which supports and fosters mental health awareness and workplace wellness is essential. The Agency has established dedicated psychological support services, which includes the employment of a dedicated psychologist with the responsibility to provide guidance to managers on recognizing mental health concerns in an armed workforce,Footnote 27 and has also developed a Strategy to Support Mental Health,Footnote 28 which outlines the importance of the implementation of tools and initiatives to support frontline employees working in an armed environment. However, there was a general consensus amongst interviewees both in the regions and at National Headquarters that mental health training is a priority and further work is needed to ensure frontline staff and management have support tools (i.e. implementation of existing mental health strategies and tools, support for managers in the removal and return of the duty firearm to officers, additional support for officers in engaging with clients with mental illness) and to ensure that stigma surrounding access to mental health support is addressed. There was an overall sentiment expressed amongst frontline employees and interviewees at National Headquarters, that the existing defensive equipment, as a system, should be reviewed (including the weight of the soft body armour and duty belt with its components, as well as he make/model of the duty firearm) in order to ensure that the long-term physical impacts of the equipment are fully assessed and addressed. This may be considered in the context of the overall officer uniform, including the integration of other equipment such as, radios and other devices worn or carried by officers. With regards to training, interviewees also identified challenges related to the potential effects of the arming of CBSA frontline personnel on recruitment and verbal de-escalation skills of new recruits.Footnote 29 These issues will be explored further in the Agency's upcoming evaluation of the Officer Induction Model. The Arming Initiative was implemented as intended; targets to train and arm the frontline workforce were achieved within the timeline and under the original budget; and the Agency's relationship with other law enforcement (i.e. the RCMP) was effectively leveraged. By March 2016, the conclusion of the Arming Initiative, over 6,492 officers had been trained and armed, exceeding the initial target of 4,800 (refer to Exhibit 3). In addition, this target was exceeded under budget, with a budget variance between planned ($785M) and actual ($694M) expenditures of -12% (refer to Appendix B, Exhibit A), as of April 2016. The availability of employees for training following its acceleration during the final years of implementation. During the first five years of the Initiative, the Agency trained at a rate of approximately 300 to 500 officers, per year. However, when the construction of the Rigaud training facilities was completed in 2012, the training rate increased dramatically. In the final years of implementation, the Agency trained at a rate of 1,000 to 1,500 officers per year. Furthermore, the pool of national and regional Use of Force instructors rose from approximately 80 in 2010 to over 300 in 2015. The partnership with the RCMP was highlighted by key stakeholders as having been an important contributor to the successful implementation of the Arming Initiative. As a result of the CBSA's proactive secondment of qualified RCMP personnel, the RCMP provided assistance in a number of key areas, including: the design of the initial model for the DFC, the access to existing training infrastructure, the creation of new training centres, the procurement of the CBSA duty firearm, the training of arming instructors and the development of the Arming Policy Suite. After 2007, the CBSA launched internal selection processes to increase its instructor capacity so as to staff campuses responsible for the on-going delivery of the Duty Firearm Course (Chilliwack, Ottawa and Summerside). In turn, the Agency's model for training qualified instructors, in addition to its development of dedicated training centres (such as the opening of the arming facilities at the CBSA College in Rigaud), provided key support for the Initiative. Arming governance and management was shifted and modified during the implementation of the Arming Initiative to improve delivery and to help ensure objectives were met. Monthly Arming Coordinator conference calls/Annual Training Schedule Planning Sessions. Following the conclusion of the Arming Initiative, many formal governance mechanisms dissolved and have since been replaced with the "one HR" approach to address ongoing policy and human resources issues. With Arming integrated into regular CBSA operations, opportunities for improved economy and efficiency related to training and recertification have been identified. With the transition to steady-state completed in March 2017, documents and feedback from interviewees have identified potential opportunities for improvement to the Defensive Tactics Program and to the Agency as an armed law enforcement organization. Following the conclusion of the Arming Initiative, the Agency reduced its training footprint from four training sites to two. Modular facilities in Ottawa and in Summerside, Prince Edward Island are no longer in use. The DFC is now delivered by the CBSA College in Rigaud, while the Triennial Recertification is delivered in Rigaud and at a joint CBSA-RCMP firing range in Chilliwack, British Columbia. SECs are delivered in various regional locations. While the evaluation did not examine trends in the per participant cost of training, by region, interviews and field research suggested efficiencies could be realized through greater local/regional delivery of certain recertification training to reduce travel costs and increase convenience for officers. Enhancing partnerships with other law enforcement organizations to further facilitate the sharing of resources (e.g. U.S. Customs and Border Protection on-site practice/training facilities) was also suggested by respondents. The Agency DFC and Triennial Recertification training are well-regarded and widely viewed as having evolved and improved over the 10-year Arming Initiative. Aligning training to the standards and practices of other federal armed organizations, while ensuring specificity to officers' unique work contexts, was a consistent theme of officers' and managers' feedback. Interviewees identified a need to review the current Course of Fire, including the 25-metre qualifying requirement, with consideration for the CBSA operational environment and as compared to the practices of other law enforcement organizations such as, the dynamic shooting drills and Course of Fire adopted by the RCMP in 2016. The Human Resources Branch (HRB) agrees with the findings and recommendations identified in this review of CBSA’s Defensive Tactics Program previously known as the Arming Division. Notwithstanding earlier favourable assessments, the first via an independent, third-party review of the Arming program (Deloitte Canada: December 2013) and the second via an internal CBSA Audit of the Arming program (November 2015), HRB welcomes the opportunity to actively shape the Defensive Tactics program’s evolution in support of a post-implementation, steady-state armed workforce. HRB is of the view that information gathered in the course of the evaluation’s field research was insightful and helpful, especially in combination with completed and/or HRB work already underway. HRB has developed this Management Response and Action Plan with a view to shaping the future of the Defensive Tactics Program in a way that will help: officers in all modes (Land, Air, Marine) needing an accommodation; the streamlining of occupational groups; advance CBSA Mental Health and Workplace Wellbeing initiatives for officers and their managers/supervisors; ensure a comprehensive ergonomic review of the uniform including defensive equipment; and facilitate a responsive training curriculum via a new Defensive Tactics Council and related sub-committees who, among other things, will be keenly interested in the impact of responses to recommendation on practice, training curriculum, success rates and infrastructure. HRB’s ultimate aim is to ensure that officers in all modes are able to properly interpret and apply policies to carry out their duties as safely and efficiently as possible and that the Agency has the capacity to effectively address the evolving threat to officers and public safety. The Workforce Strategy as it relates to the arming of officers, will be implemented within the CBSA renewal timelines. Data gathering and validation - Capturing employee information as it relates to their limitations and restrictions and updating lists of accommodated employees, per region. The Human Resources Branch agrees, in consultation with Operations and Programs Branches, with the recommendation and will communicate clarified direction to officers and their supervisors. The Human Resources Branch agrees with the recommendation which highlights initiatives already in progress as part of the Agency's mental health Strategy implementation. The CBSA began addressing mental health issues as a priority in 2015 and launched its Strategy to Support Mental Health 2016-2019 in July 2016. The Human Resources Branch and Operations Branch agree with the recommendation to complete an assessment of the uniform and duty equipment as a self-defence system, with consideration for ergonomic issues and will take steps to ensure this is completed. The Defensive Tactics Program Division/Training and Development Directorate/Human Resources Branch acknowledges the important need for regular review of training and skills maintenance, qualification requirements as part of ongoing Defensive Tactics Program development including use of new technologies. The Defensive Tactics Council and associated sub-committees will be established with a focus on providing advice and guidance on the continued development, implementation and refinement of the CBSA Defensive Tactics Training Curriculum, including qualification requirements. Further, work is underway to procure training simulators as a means of increasing access to a training environment for practice and/or qualification. A performance measurement strategy will also be developed to ensure ongoing monitoring and reporting. *Subject to Contracting and Procurement Policies. In June 2006, the Government of Canada approved a 10-year implementation strategy for equipping and training 4,800 CBSA officers to carry a duty firearm. Prior to being issued and permitted to carry a duty firearm, an officer must successfully complete a medical assessment, a two-part psychological assessment and an 18-day long CBSA DFC (inland officers attend a 20-day course). During the Arming Initiative, experienced officers participated in the DFC at one of four locations – the CBSA College at Rigaud, Quebec (2012 onward), a joint CBSA-RCMP facility in Chilliwack, British Columbia, or modular firing range training facilities in Ottawa or in Summerside, Prince Edward Island. The modular training facilities were decommissioned in 2015. The DFC was integrated into the OITP training for new recruits in 2012. The DFC curriculum includes firearm proficiency and scenario-based training (including communication and de-escalation techniques), in which officers must demonstrate proficiency in assessing risk, using the appropriate intervention option and making the appropriate decision in the use of force. The CBSA SOP on Agency Firearms and Defensive Equipment requires that armed officers be recertified in the use of the duty firearm every 12 months, which involves a one-day training course, typically delivered locally. Every three years, armed officers take part in an extended five-day recertification session. The Triennial Recertification includes training on marksmanship, control and defensive tactics, judgment, and legal articulation. In FY 2016-2017, the Agency replaced the pass/fail component of the SBT undertaken during the Triennial Recertification with an alternative regime. This is intended to provide officers with an opportunity to demonstrate their proficiency and to work with instructors to enhance their technique, improve their skills, and be provided with informal feedback. In turn, officers are only required to obtain a passing score in marksmanship. For officers who are unable to pass a component of the DFC or their annual recertification, an SEC is offered. In addition to classroom and online training, scenario-based training exercises can be carried out at the POE, such as 'red gun exercises' to simulate emergency events within a controlled exercise environment where personnel and equipment are deployed as if the scenario was really happening. Prior to April 2014, all officers participated in an annual mandatory live-fire practice session under the supervision of an Agency firearm instructor. In April 2014, arming management issued a bulletin that ended the mandatory supervised practice session, with the exception of one mandatory supervised practice session following completion of the OITP/DFC. Officers are authorized to practice on their own time, at personal cost, with the issued duty firearm and the CBSA provided practice ammunition. While part of an efficiency exercise under the Deficit Reduction Action Plan, the replacement of the mandatory supervised practice policy with an off-duty practice policy was also identified as a means to align the CBSA with the practices of other law enforcement organizations, to reduce operational pressures and allow trainers to support other priorities related to arming training. The Arming Initiative required the development of a suite including policies, directives, SOPs, guidelines, standards and bulletins related to Arming. When a duty firearm is drawn or discharged, it is recorded as a use of force incident in the IMRS. A Use of Force Incident Report must be completed by an officer for any incident involving a firearm. All incident reports are required to be reviewed by local management; a CBSA Use of Force instructor; and the Incident Review Committee under the responsibility of the Defensive Tactics Program Division. The CBSA Corporate Administrative System was also used for the tracking and maintenance of the duty firearm and ammunition; and the management of arming training including the prerequisites to attend training, core training and recertification anniversary dates. Management and governance of the Arming Initiative evolved during its 10-year implementation. Initially, the CBSA Operations Branch was assigned responsibility for implementing the Arming Initiative. A formal governance structure was established to provide regular feedback and the engagement of Senior Management, as well as oversight for the work of the Arming Task Force (which later became the Arming Division, now the Defensive Tactics Program Division). In the context of CBSA's 2010 Change Agenda, responsibility for the Arming Initiative was transferred to the Programs Branch while responsibility for training and administration was placed with the HRB. Senior governance and the Committee structure was streamlined in order to promote more timely decision making and better alignment with plans and priorities. In February 2011, the decision was made to re-establish the Arming Division within HRB by re-integrating various elements that had been divided up across TDD and the Programs Branch, and a more robust governance structure was also re-established, updated and aligned with the overall Agency governance model. In July 2012, the Arming Implementation Plan 2012-2016 was presented to and endorsed by the Executive Committee which positioned the Agency for the remaining four years of the Initiative. Source: Internal Human Resources Branch data. Of a total $1.07B funding profile approved by the Government of Canada, $785M was allocated toward the Arming Initiative. The Agency made a decision to manage the remaining $289M separately as part of the "doubling-up" project within Operations Branch. In total, $693M of the budgeted 785M was expended over the 10-year implementation for costs including: construction of new firearms training facilities at the CBSA College in Rigaud; firearms acquisitions; and associated systems (refer to Exhibit A). As aspects of the Arming Initiative have been assessed in the past, a review of past audits and evaluations, including the Evaluation of Arming (2009) and the Audit of Arming (2015), was undertaken. Additionally, relevant policies and directives, existing program documentation, standard operating procedures, priority documents and corporate documents were reviewed. In order to determine program expenditures and results (for example, alignment between planned and actual spending), an analysis of program financial data was completed. As well, Agency performance data was analyzed to confirm the number of designated armed positions and the number of armed CBSA officers and to examine the extent to which the Initiative achieved its objectives (e.g. through analysis of use of force incidents and the number and nature of threats intercepted at the border by CBSA officers). Interviews were conducted with program representatives, including program personnel within the HRB, as well as representatives of other branches (Operations, Programs, Comptrollership) involved in, or impacted by, Arming. In total, 26 interviews were conducted with 30 individuals. The interviews provided qualitative information to clarify, corroborate and/or contextualize other data. The evaluation team visited three main sites between February 2017 and March 2017: Quebec, Prairie and Southern Ontario Regions. Each visit included group interviews with officers (experienced and new and at land POEs, inland offices, and marine contexts), frontline management (superintendents and chiefs), and regional managers. In addition, in each region, interviews were conducted with representatives of external law enforcement organizations. The Incident Management Intervention Model is represented by a circular diagram. Tactical repositioning represents the escalation of response options. At the lowest level of response is officer presence, which is linked with all response options via officers' perceptions and tactical considerations. The second response option is communication. The communication response continues in all levels of response, including physical control. Physical control ranges from soft physical control to hard physical control, which can include intermediate weapons. The final response option is lethal force. 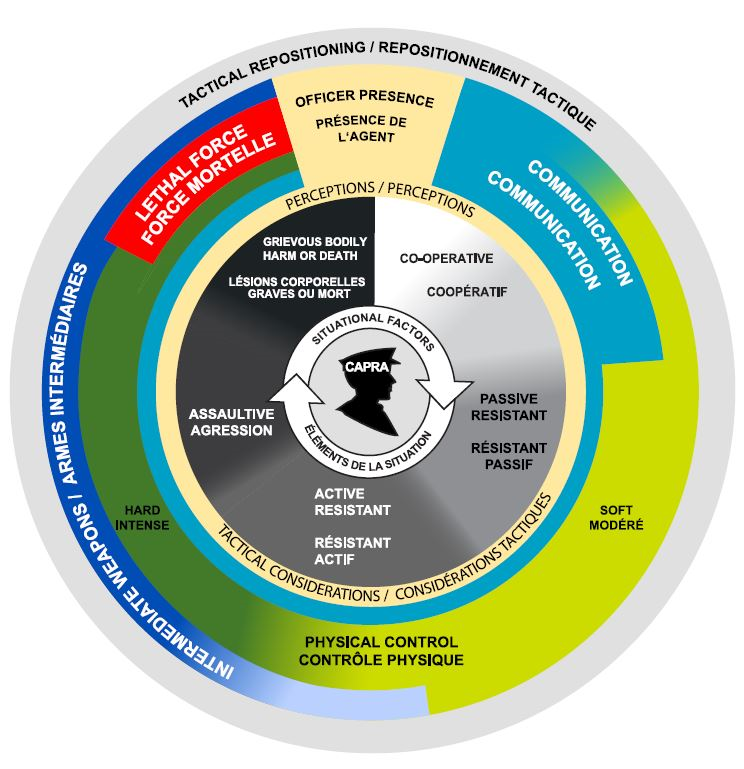 The diagram also outlines the situational factors relevant to an officer's perceptions and tactical considerations and which influence the escalation of response options following an officer's risk assessment. At the lowest level is co-operative, followed by passive resistant, active resistant, assaultive, and grievous bodily harm or death. At the center of the diagram is the acronym "CAPRA," which links to the entire wheel of response options and the identified situational factors. CAPRA stands for Clients; Acquiring and Analyzing Information; Partnerships; Response; and Assessment. This model represents the six-month replacement of temporarily accommodated employees and assumes that temporary accommodation cases have an average duration of six months. Additionally, this model assumes that half of temporarily accommodated employees would be substituted (via overtime) only half of the time, to account for shifts in operational requirements by season (spring/summer assumed as the most operationally demanding). To calculate cost in this model, salary was estimated at 1.75 times the FB-03 salary (overtime salary), multiplied by 0.25 (to represent a six month accommodation duration and substitution half of that time). Salary was then multiplied by the number f temporary accommodation cases, per region. Source: Regional Corporate and Program Services Directors, as of April 2017. Cost analysis conducted as part of the evaluation. This model assumes that temporary accommodations have an average duration of one-year (the 12-month maximum for a temporary accommodation) with substitution (via overtime) only half of the time, to account for shifts in operational requirements by season (spring/summer assumed as the most operationally demanding). To calculate cost in this model, salary was estimated at 1.75 times the FB-03 salary (overtime salary), multiplied by 0.50 (to represent a one year accommodation duration and substitution half of that time). Salary was then multiplied by the number of temporary accommodation cases, per region. This model represents costs associated with permanent accommodation and assumed to be annual and ongoing. This model assumes that permanently accommodated employees would be replaced half of the time (six months), based on operational requirements by season (spring/summer assumed as the most operationally demanding). To calculate cost for this model, salary was estimated at 1.75 times the FB-03 salary (overtime salary), multiplied by 0.50 (to represent substitution half of one year). Salary was then multiplied by the number of permanent accommodation cases, per region. Findings related to the achievement of this outcome were limited by the lack of available baseline pre-arming (prior to 2006) data with which to quantify impacts. The current phase of the Workforce Strategy involves a process whereby placement opportunities, for which the employee meets the conditions of employment, are identified for accommodated employees. The placement opportunities are intended to provide meaningful work which addresses operational priorities. The Workforce Strategy is in line with the Agency's legal obligations as they relate to the Canadian Human Rights Act. CBSA. Audit of Arming, June 2015. Refer to Appendix B for a more detailed description of the project. The Arming Division was transferred to the HRB in October 2009 from the Operations Branch. 'Experienced officers' is defined herein as designated armed officers with experience prior to and following the implementation of the Arming Initiative in March 2006. 'Red gun exercises' are defined herein as on-site, group training activities which provide an opportunity for POE officers to run through realistic scenarios, in the port environment, with their colleagues. Calculated based on the number of seats taken in SECs, divided by the total number of armed officers, per FY. The number of armed officers was based on Arming Performance Reports data, FY 2013-2014 to FY 2015-2016. The SEC was first introduced in FY 2012-2013. In FY 2016-2017, the SBT component of the Triennial Recertification was no longer pass/fail. In FY 2016-2017, the CBSA introduced three-day and one-day SECs. This percentage represents an average of both courses. In FY 2016-2017, the CBSA introduced one-day and three-day SEC courses. Approved practice ranges meet Occupational Health and Safety requirements. Distance in minutes was calculated based on travel by car. According to the CBSA Standard Operating Procedures on Use of Force and Reporting, a use of force incident occurs when the following conditions exist: a. OC spray or baton is drawn in the presence of a member of the public; a firearm is drawn under any circumstance (not to include training, inspection, loading or unloading); any piece of defensive equipment is used against a member of the public (with the exception of handcuffs being applied to a cooperative individual); an officer uses physical force to compel compliance, whether or not it results in serious injury or any matter requiring medical attention; or the discharge of any firearm, accidental or otherwise (not to include authorized training). IMRS data, as of June 2017. Low-ready is defined herein as when an officer removes their firearm from the holster but does not point the firearm at an individual. An armed and dangerous lookout is defined herein as a CBSA issued lookout which contains an officer safety caution which involves an armed and dangerous individual. Integrated Customs Enforcement System data, as of May 2017. Internal HRB data, as of June 2017. Nationally, arming-related accommodation cases are divided into two categories: temporary and permanent. Temporary accommodation cases are those with a duration of one-year or less, while permanent accommodation cases are those with a duration of over one year. The definition of permanent accommodation can be problematic, as it encompasses a wide variety of circumstances, including: unsuitable psychological assessment results; not meeting CATIII medical requirements; religious conviction; and chronic medical conditions. CBSA. Policy on the Duty to Accommodate, 2011. A definition of the scope of the accommodation cases used to calculate this percentage population was not available. Data supplied by Regional Corporate and Program Services Directors, as of April 2017. Refer to Appendix E, Exhibits E to G for more detail on the cost analysis conducted as part of the evaluation. CBSA. Part 7: Wearing of Protective and Defensive Equipment, CBSA Standard Operating Procedures on Agency Firearms and Defensive Equipment, April 2014; CBSA. Part 3 – Selection, Chapter 6 – Surveillance, CBSA Enforcement Manual. This also includes, for example, day-to-day interactions/communications with regional managers, and regional presentations, visits and policy/online material. CBSA. A Strategy to Support Mental Health, 2016-2019. Verbal de-escalation skills are an integral part of the existing Use of Force training and the Incident Management Intervention Model. Outside of the Arming Initiative project phase, which concluded in March 2016. The middle of the FB-03 pay scale is between Steps 2 and 3, and is estimated at $66,315, as of June 21, 2013.